Some live for adventure: Discovering new places, meeting new people and culture is what they want the most. Bosnian traveler Amar Camo is a man who discovered his urge to see the world at a very young age. In a way, he is similar to Evliya Çelebi, the 17th-century Ottoman explorer, who traveled through the Ottoman territories and neighboring countries over a period of 40 years, recording his adventures in his travelogue "Seyahatname" (Book of Travel). Camo works as a land surveyor in Australia. But his life changed when he bought a 1976 Zastava 750, an old Yugoslavian car, during his visit to his homeland Bosnia. 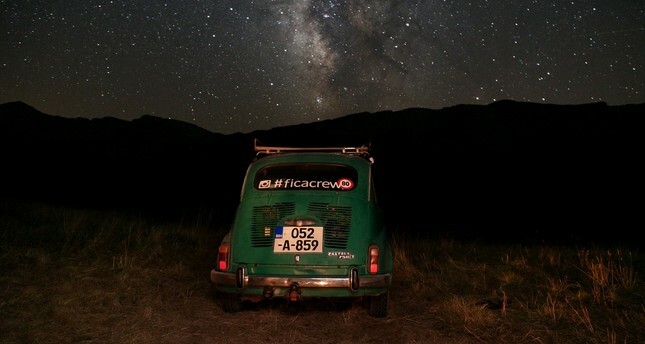 He named the classic car "Fica," and headed off to travel the world in his car. So far, he has visited 11 countries in the course of three years. A classic car enthusiast, Camo restored "Fica," which was known as "the car of the people" when it was first launched, on his own and fell in love with the outcome. He first started to drive around Bosnia to discover the hidden gems of his homeland and then hit the roads to discover other countries and meet new people around the world. In his green car, Camo first headed for Italy, which he says was the turning point. The excitement of discovering miles after miles in his small car and driving to places that a tourist cannot easily discover turned the young Bosnian into a modern-day Evliya Çelebi. Camo likes to share his travels with his friends and other travel companions he met on the way. He calls his friends "Ficacrew" and shares his love for travels with others. So far, he has traveled to Croatia, Slovenia, Austria, Kosovo, Montenegro, Albania, Serbia, Bulgaria, Greece and Turkey with his little but iconic car. But having a classic car and driving it for so many hours comes at a price. Camo's car often feels weary by the kilometers it covers and breaks down. But he rolls up his sleeves to get his old friend back on the road. Camo says he does not need a well-equipped garage and that nature is his own garage. Perhaps, the best part of traveling by your own car is that you do not have to trap yourselves inside four walls. Whenever tired, Camo erects his tent by the best view and spends the night under the stars. During his visit to Turkey, Camo shared his story with Anadolu Agency (AA). Camo shares a love for classic cars and that is how he decided to buy "Fica." But he had no idea that this small car will be his travel companion for years to come. "Everyone in Bosnia has a story or a memory about a Zastava 750. I just wanted to have one for my own," Camo said. Camo said that he first started by discovering Bosnia during holidays. He then found himself increasingly on the roads and turned traveling into a full-time job. However, he is very frank about the hardships of his travels as well as its delights. "Sometimes when 'Fica' breaks down, I have to push it just to help it a jump-start. I sometimes ask for other people's help on the road and everywhere I go, people are happy to do so," he said. Among all his journeys, Camo said the one to Istanbul was the most incredible. "While I was driving on the streets of Istanbul, some people stopped and asked if I needed any help. They must have thought I was lost. But they called me friend and invited me for tea. We drank tea and have a chat for two hours. When it was time for me to leave they even gave me a present. It was wonderful," said Camo. Although traveling is more than a passion for Camo and he enjoys every second of it, he does not lie about the physical challenges. "For me, the most challenging part is erecting a tent after hours of driving," he said. He also shares the stories of his journeys with "Fica" on his Instagram account "Ficacrew." Through social media, Camo has the opportunity to share his passion with other travelers and meet new people. He said that since he travels a lot in Bosnia, the Instagram account also helps him promote his home country. The longest journey of Camo and "Fica," on the other hand, will start this week. "We will travel to Italy then head for Tunisia. From there Fica and I will travel through Algeria, Morocco and then to Spain. We will return to Bosnia across Europe," Camo said.